This post was made possible by Digiarty Software through compensation. The actual contents and opinions are the sole views of the author, who maintains editorial independence, even when a post is sponsored. For more details, please read our disclaimer. The holiday season can be characterized by winter sweaters, hot cocoa, and the gathering of friends and family. An unavoidable part of the latter is home movies. Lots and lots of home movies. If you’re hosting a Christmas or New Year’s party, you can reasonably expect to have to view them, make them 10 Simple Tips To Make Home Videos Look Professional 10 Simple Tips To Make Home Videos Look Professional As mobile phone cameras have gotten progressively better, they've become reliable tools for recording videos on the go. Here are 10 tips for making your videos look professional. Read More , and yes, even share them. The last bit is quite tricky. You can blame the fragmentation of the computer and mobile market. Your family members are likely using an array of different devices, each only supporting specific video codecs, and specific file formats. You need a really good video converter. Now, let’s be frank. There’s no shortage of programs on the Internet that promise to make it easy to convert between video formats, and most of them are terrible. They either don’t work as advertised, or are just cleverly disguised malware programs designed to surreptitiously flood your computer with malware and other unwanted fluff. We’ve written about these in the past — perform a search if you’re interested. Thankfully, there is one program that does deliver. It’s called WinX HD Video Converter Deluxe by Digiarty Software. We’ve covered this before, and like then, we still believe it’s one of the best tools for managing diverse types of video. Don’t be fooled. Despite the name, there’s a Mac version of this package. This review looks at that. But it’s worth nothing that the differences the two are mostly skin deep. Both packages are immensely powerful, and support conversions between a dizzying array of file formats. Both can handle high definition video up to and beyond 4K without breaking sweat, and can even handle multi-track video. It’s also worth nothing that pricing is pretty consistent too, with both packages costing $50, although at the time of writing they have been discounted to $35. It’s also worth noting that there’s a trial version that allows you to convert any video under five minutes in length for free. Although fundamentally different in their aesthetic, both packages are incredibly easy to use, and are ludicrously powerful. Don’t believe me? Here’s how I converted a high definition video from MP4 to AVI, in matter of minutes. If you have used FFMPEG (the most popular open-source video converter 10 Great Apps to Convert Audio & Video Files in Linux 10 Great Apps to Convert Audio & Video Files in Linux Read More ) before, you know how much of a chore it can be to actually change between codecs. It requires a level of confidence on the command line, and a bit of know-how when it comes to its specialized syntax. It should be easier. And with that in mind, WinX HD Video Converter is a breath of fresh air. Converting content is done in a single window pane. Just drag and drop the original video into the app, specify the output format and quality, and then specify the output folder. Once you’re happy, press ‘Run’. And that’s it really. That’s the basics you need to do in order to convert a video. But there are thousands of video conversion packages which do just that. WinX HD Video Converter distinguishes itself by how it provides the user an ability to fine-tune the conversion process, in addition to the range of extras packed in. Suppose you need to prepare a video for your mother’s tablet computer, but you don’t know the exact size, codec, and ratio to use? WinX HD Video Converter has you covered with predefined settings for a wide variety of devices. WinX HD Video Converter also makes it easy to strip audio from video in just a matter of clicks. If you’ve bought a computer after 2007, odds are good it comes with an multi-core processor. It’s most likely a dual-core processor, although quad and octo-core processors are not unheard of. This app makes it easy to leverage these additional cores in order to more expediently process and convert video. One of the more useful bonuses is a tool for downloading YouTube. While there are no shortage of Google Chrome and Firefox plug-ins that do this, WinX HD Video Downloader distinguishes itself by allowing you to convert video as you download it. We’re going to try this with Dave LeClair’s coverage from MAGFest 12. When you select your video, you can choose the resolution of what you download. This can range from austere 256P, to ultra-high definition video. Videos can be queued for sequential downloading. Then it is just a matter of pressing ‘Download Now’, and waiting for WinX HD Video Downloader to run its course. Other features that you might find useful include a screen recorder, which allows you to make high-definition screencasts, while tracking your mouse for extra clarity. You can also use WinX HD Video Converter to record video footage from your webcam. WinX HD Video Converter comes with some rudimentary video editing facilities. Whilst they’ve not of the depth and complexity of Adobe Premiere, they have a lot to offer anyone looking to chop-up some family movies, or for anyone looking to get their feet wet on Youtube. Videos can be clipped, cropped and expanded, and you can even add subtitles and watermarks. The latter is handy if you’ve eager to stop people from ripping off your Youtube clips. Surprisingly, WinX HD Video Converter comes with a feature often found in high-end editing suites: HD Multi-Track editing. Any video you produce can have multiple videos, subtitles and audio tracks. Whilst this can mean larger file sizes, it also means that anyone who views your video can select the quality and language. You can download WinX HD Video Converter Deluxe for Windows and WinX HD Video Converter for Mac online right now. A license should set you back around $50, and comes with all the features mentioned in this article. It’s simple, it’s powerful, and if you are prosumer who regularly has to work a video you need this app. 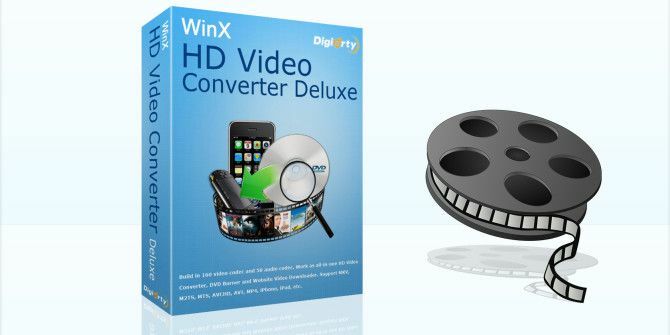 For a limited time, WinX is giving away free copies of both WinX HD Video Converter Deluxe for Windows and WinX HD Video Converter for Mac. This special giveaway version of the application is fully-functional, and will remove the 5-minute time restriction. You’re free to use it for as long as you wish, but it cannot be upgraded. You may use it on as many computers as you need. To obtain a copy, all you need to do is share this giveaway through the widget below. Further instructions will be revealed, and you will receive a trial version of the application as well as a registration code. This code is only valid until December 11, and you must register the application before it expires. Explore more about: MakeUseOf Giveaway, Video Editor. Owww, snap, the page said it has to be activated before 12th lol I didn't read it before. Should the activation before 11th too? Just tweeted this to my Twitter account and nothing happened. Also posted on Facebook with the same results. I paste a you tube url and hit analyze. Nothing happens. no options open. Just a black video screen and ....nothing! Steve Roberts, click on the "claim" icon, it will redirect you to their website, where's a section called "giveaway version". There you get a .zip with the .dmg (I suppose .exe for Win users) and a Licence Code.txt . sharewareonsale.com is where ya can lots of stuff free with lifetime use but ya gotta buy the product at a low price to get free upgrades. That's where I got the product at and all it takes is an e-mail address for some of it but others they want an email address to send the registration to. By the way CyberGhost they are selling for 9.99 I think it is and it's unlimited bandwidth and all the goodies. Awesome! Thanks for the free activation code. I've shared it on Facebook, followed instructions it tells me that code is in zip, but I am unable to find the zip to download. We're running around in shorts and flops here in Florida watching all the Northerners shovel snow and build snowmen on TV... Happy Holidays!